Plan iterations and releases NEW - now with quick-start project templates! Follow a repeatable process NEW - Bundled OpenUP process! Are you a technical lead who could use a little help organizing your team's iterative work? Or perhaps you are a consultant who needs a tool to quickly collect the state of the projects you are getting into? Or maybe you are just looking for a handy tool to help you keep your own agile work under control? Whether your project is UP-based or plain agile, ProjectKoach provides a complete toolbox with all the iteration planning and control tools you will ever need. ProjectKoach is a normal desktop application available for all the major platforms. It is also available as an Eclipse plug-in. ProjectKoach provides all your planning tools in a single workspace where planning is intuitive, you always have up-to-date status of your project, and where re-planning is a matter of simple drag-and-drop. Everything just fits together and it is all fully integrated - make a change in one place and everything else just follows right before your eyes! Just like you should expect from agile planning tools. We saw right away that our delivery date was indeed weeks after what we thought. On a daily basis, our developers could see what they needed to do to help bring the project back on track. For each new request we received from our stakeholders, we could show them the impact right there. ProjectKoach combines RUP and Agile to great effect. Don't leave work without it!" "As a developer, I found ProjectKoach most useful - it was clean and easy to understand. The energy normally dedicated to organizational tasks was now spent in development. I have not come across a better tool for relating development of use cases within a project plan. After the coffee maker, it’s the next best tool in the office!" ProjectKoach 2012 introduces two features that will make your life as project manager so much easier: Linking with external process web sites, and use and creation of project templates. Linked process pages are selected based on individual tasks, so that your team always have the right process at their fingertips without having to wade through, and interpret, massive process documentation. The bundled OpenUP for ProjectKoach process is a full version of OpenUP ready for use. Project templates offer one-click project plan creation, which means that you can be underway with your new project in just a matter of seconds - literally! The bundled project template for OpenUP projects links your new project automatically to the bundled OpenUP process web site, and a process model that helps you instantiate the full OpenUP process inside ProjectKoach! With the plan editor, requirements backlog, task lists and bugs all in the same workspace you have full control and overview of your project data at all times. Editing requirements and iteration plans is as easy as editing other files in your workspace. 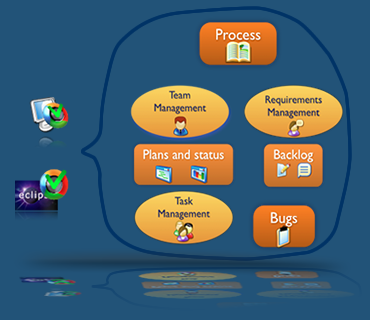 ProjectKoach's structured requirements backlog helps you organize your requirements just like in your file system, and it helps you keep track of new requirements as they arrive; whether you are using your favorite editor, like Microsoft Word for example, or one of Eclipse's built-in editor, the steady flow of new requirements is kept under control at all times. And you plan your work simply by dragging-and-dropping requirements onto the iteration plans where you assign tasks and estimate and monitor progress. All in the same workspace. The feature list doesn't stop there; there is a wealth of built-in features to make your project planning life easier! See the full feature list. If you want to install the standalone ProjectKoach desktop application, go to the download page and download and install it like any other desktop application. If you are an Eclipse user, installing ProjectKoach is as easy as installing other Eclipse plug-ins: just point Eclipse to the update site and Eclipse downloads and installs it for you. The basic ProjectKoach is available absolutely free of charge, and it is a perfect starter choice if you are a Scrum master or project manager who are learning the basic agile principles. You can use it to run your projects from start to finish, and you can create as many projects you wish for as long as you like, and of any size. You can even share your project data with your team. Built for teamwork, both yourself and your team can use the Eclipse plug-in in their IDE or use the standalone desktop application. Your project environment can include any combination of licensed and free versions - plug-ins and desktop application versions - and ProjectKoach is available on all major platforms. ProjectKoach supports all popular teamwork solutions available in Eclipse: CVS, Subversion and Git. ProjectKoach is built on the powerful Eclipse framework, to give you an optimal agile planning user experience. If you are an Eclipse user, you already know how to work with ProjectKoach. With the plan editor, requirements backlog, task lists and bugs all in the same workspace (or perspective) you have full control and overview of your project data at all times. Editing requirements and iteration plans is as easy as editing other files in your workspace. if you don't know what Eclipse is - don't worry. ProjectKoach is just like any other desktop application you have on your computer, and it just happens to be built with one of the most powerful frameworks there are, resulting in an unprecedented easy-to-use product. All to your benefit.